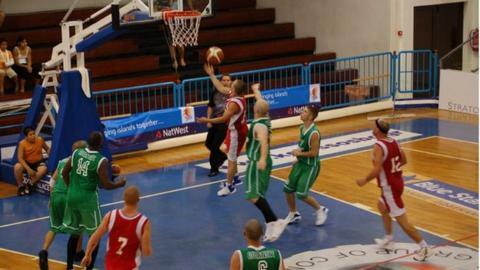 Guernsey's basketball squad could pull out of this summer's Island Games unless more teams compete. Only four men's teams and three women's teams have agreed to take part in the event in Bermuda due to the cost of sending teams to the Atlantic island. Guernsey will decide on Friday whether to confirm charter flights to the event in July for their 30-strong squad. "Bermuda have been let down by other islands," Guernsey Games chief Dave Inglis told BBC Guernsey. "It takes in 30 competitors and had a big bearing on transportation and hotel accommodation." Each player has raised about £2,000 for the trip but islands such as Rhodes, Menorca and Gibraltar, as well as 2015 hosts Jersey, have all opted to stay at home. Only Bermuda, the Cayman Islands and the Estonian island of Saaremaa have so far committed to playing this summer. "Yes, it's expensive going their way, but they come our way every two years," said Guernsey's Island Games liaison director Jon Marley. "But we all knew four years ago we were going to Bermuda, so as a one-off they should have saved to get themselves over there. "If we can get at least one other island to join the other four men's teams and make a reasonable tournament, then certainly the men will be travelling. "I'm more hopeful on the men travelling than the ladies as things stand." The Bermudian authorities are considering asking teams from North America to guest at the tournament in order to make the competition more viable. "I've asked if there any collegiate teams from the US or Canada that could fill the gaps and make a worthwhile tournament," Marley added. "Bermuda have said they were thinking along the same lines as well, but we just don't know where we are right now."